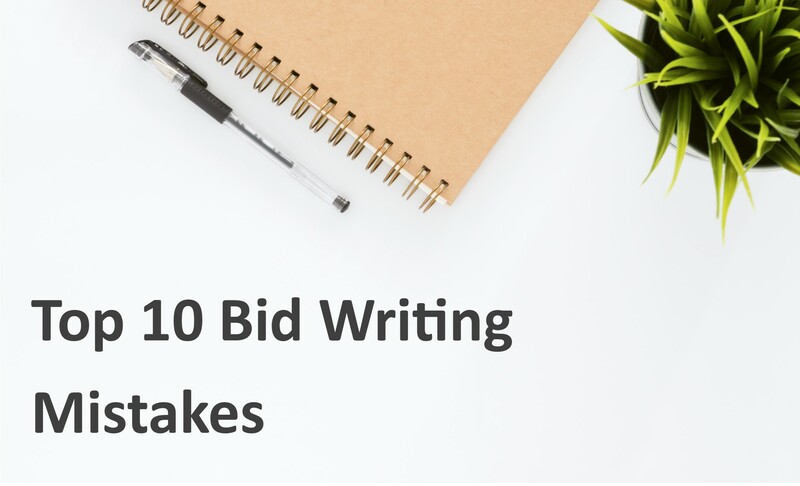 To help you win more tenders, we have compiled a list of some of the most common bid writing mistakes and how to avoid them. Bidding can be a complicated game and even the best writers sometimes make mistakes. Each step of the process seems to throw up new challenges and it can be hard to know how best to tackle them. One mistake can mean the difference between success and failure. It can be tempting to go for the biggest contract you find. As a general rule, bid for contracts 1/3 the value of your annual turnover. Any more than this, and the buyer may exclude you. It’s an easy mistake to make, but can cost time and money. Before starting the bid, check the specification for compliance requirements: Policies, Procedures, Turnover, Accreditation, Experience. If you don’t meet requirements, you’re not compliant so there’s no point carrying on. Can you complete the work? While seemingly obvious, it’s important to consider whether you can carry out the work required. Do you have enough staff? Do you have enough knowledge and experience? Can you fit the new work into your existing schedule? If you can’t comfortably accommodate the new work, you may not want to continue. Before rushing to start writing, read the question carefully and consider what it’s asking. Plan your response with the question in mind, if there is a marking criteria make sure you stick to it. As you create your response, constantly refer to the question. Does your response answer the question? Put yourself in the buyer’s shoes and question if you’ve said what they want to hear. It is important to show the buyer that you’re an expert in your industry but be careful not to over-do the jargon. While acronyms, technical information and product details are second nature to you, your reader may not be as knowledgeable. Technical details can add a lot of value, but your response must be clear to all readers. Make sure to constantly consider the contract specification as you write your responses. You may be putting forward some great information, but it may not be what the buyer wants to hear. Of course, you should present value adds, but make sure they’re relevant and focus on the core requirements first. Make sure you’re addressing the contract requirements – have you explained how you will meet them all? Be thorough – you don’t want to miss anything. Is it relevant to the contract requirements? Have you removed all details of previous clients? – Referring to the wrong company is a sure-fire way to lose you marks. You must make sure to add as much value as possible to your responses. Go beyond the stated requirements to show why you’re the best. Tell the buyer what you can offer beyond the scope of service – social initiatives, additional services, innovations and so on. Your value adds should be relevant to the service however. Ask yourself whether they effectively ‘add value’ to your proposal – if they don’t, then re-think your response. You should read the contract specification and think of initiatives which complement the requirements. A common mistake in bid writing is a reliance on the word ‘we’. When you find yourself using ‘We’ at the start of every sentence, you should maybe consider that you’re talking about yourself more than the buyer and their needs. The aim of a successful bid is to tell the buyer how you can benefit them. Recognise their needs by identifying gaps in their operation and explaining how you would address them. ‘We-ing’ is sometimes necessary but think first and then write. In bid writing, detail is everything. Every sentence you write should not only refer to the question but be packed with facts. Each statement you make must be substantiated. Back-up your points and your promises. Show evidence and offer proof where possible. If the buyer knows they can trust you, they will be more likely to hire you. This style of writing helps cut down on needless waffle and irrelevance. Arguably one of the worst things you can do in bid writing is to waffle. Again, put yourself in the shoes of your reader. They will have potentially hundreds of bids to wade through and mark, the last thing they want to see is page upon page of long-winded explanations and irrelevant detail. Keep your responses succinct. Pack in detail wherever possible and make sure that everything you say has a point to it. Not only could your reader get bored, but they may gloss over your best points. A good way to avoid waffling is to have your work reviewed by fresh eyes. A second opinion will help separate the winning work from the waffling work and will improve your final product. We understand that your bid ‘for the provision of watching paint dry’ is hardly going to be up for the Booker Prize, but you should nevertheless try to make your work interesting. Use images, diagrams and charts to add some visual appeal and keep your reader engaged. Even such small additions as subheadings, lists and tables can make a big difference. An engaged reader is less likely to miss your key points. While you may be the best wet-paint watcher in the world, unless the buyer is awake to read it, your bid won’t win. Show your passion for your product, service and industry. Keep answers succinct, and focus on the more engaging aspects of your proposal.